The City of Culver City will present the sixth annual ARTWALK Culver City on Saturday, June 4 from 2 pm to 8 pm. ARTWALK Culver City opens the doors of the area’s art galleries to introduce a wider audience to the unique vitality of the artist spaces. The event especially celebrates the Culver City Art District, a cluster of more than thirty galleries exhibiting new and distinguished artists, located near the intersection of Washington and La Ciengea Boulevards. This free, self-guided tour of local art galleries and exhibition spaces is sponsored by the Hammer Museum, ForYourArt, 89.9 KCRW, LA Weekly, Flavorpill and Sony Pictures Entertainment. Over thirty-five galleries will be open from 2:00pm to 6:00pm and selected galleries will remain open until 8:00pm that evening. Individual gallery hours may vary. The event will kick-off with a 2:00pm performance of artist Gary Baseman’s Giggle and Pop! at Helms Walk in the Helms Bakery Complex. 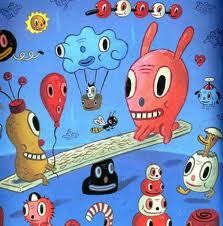 This special performance is inspired by Gary Baseman’s drawings and paintings. His “ChouChous” and “Wild Girls” come to life through the choreography of Julie Carson and students of the Culver City High School Academy of Visual and Performing Arts. The costumed characters will dance and play throughout the Culver City Art District following the performance and offer limited edition art pieces, designed by Gary Baseman and the AVPA art students under the direction of Kristine Hatanaka, to those who stop and play. Also, during the afternoon, there will be free, family-friendly, interactive art-making opportunities offered by Graphaids and Art Works Studio & Classroom in the Culver City Art District. More information about ARTWALK Culver City is available by calling the Culver City Cultural Affairs Hotline at 310.253.5716 or by visiting www.culvercity.org or the City of Culver City’s Facebook Page. The City of Culver City encourages bus transportation and bicycle riding for ARTWALK Culver City. An ARTWALK Shuttle, provided by Culver CityBus, will provide service between Downtown Culver City and the Culver City Art District throughout the event, and this year marks the first time that Bike Valet will be offered as well. ARTWALKers are encouraged to carpool. Parking for ARTWALK Culver City is available in Downtown Culver City parking structures as well as at the Helms Bakery Complex and the Exceptional Children’s Foundation in the Culver City Art District. ARTWALKers are advised to refrain from parking in the residential area surrounding the Culver City Art District. Culver CityBus will provide shuttle service for ARTWALKers along Washington and Culver Boulevards between Downtown Culver City and Fairfax Avenue for only $1 (One Dollar). ARTWALKers may board the shuttle or any Culver CityBus at participating Culver CityBus Stops and purchase an ARTWALK bus pass from the driver on the day of the event. The ARTWALK bus pass is valid for unlimited rides along the shuttle route between 2pm and 8pm. The City of Culver City’s Bicycle and Pedestrian Initiative and the Culver City Bicycle Coalition, a local chapter of the Los Angeles County Bicycle Coalition, will offer Bike Valet from 1pm to 6pm on the day of the event at 6060 Washington Boulevard, between Reid and Sentney Avenues, in the Culver City Art District. The Culver City Bicycle Coalition is an all-volunteer, member-supported organization that encourages biking, educates cyclists and motorists for safer streets, and advocates to make Culver City more bike-friendly. Founded in 1998, Los Angeles County Bicycle Coalition (LACBC) works to build a better, more bike-able Los Angeles County. LACBC is the only nonprofit, membership-based organization working exclusively for the millions of bicyclists in Los Angeles County. Through advocacy, education and outreach, Los Angeles County Bicycle Coalition brings together the diverse bicycling community in a united mission to make the entire L.A. region a safe and enjoyable place to ride. 2754 South La Cienega Blvd. 2727 South La Cienega Blvd. 2712 South La Cienega Blvd. 2600 South La Cienega Blvd. 3209 S. La Cienega Ave.
2716 South La Cienega Blvd. 2622 South La Cienega Blvd. 2632 South La Cienega Blvd. LA> 2640 South La Cienega Blvd. 2660 South La Cienega Blvd. 2642 South La Cienega Blvd. 2762 South La Cienega Blvd. Looking forward to the next art walk!